Meet Jenny Partlow. Wife, mom, entrepreneur, and LipSense lover. She’s the owner of Moss & Pearl, a beautiful and popular women’s boutique in Avoca, Iowa, featuring boutique-style clothing and accessories for women. After trying and falling in love with LipSense products, she immediately knew this would be amazing for the women shopping in her boutique and decided to become a product distributor. Jenny hired Verity & Co. for web design and development that would create a presence for her SeneGence products in addition to her brick-and-mortar boutique, but she also sells the beauty products to in-person customers at Moss & Pearl. Jenny is the sweetest thing. Before we even got started on the majority of her project, she asked for my address to send me a LipSense collection to try. I’m not much of a lip color wearer, but the product is impressive. When they say it doesn’t wipe off or smudge under any circumstance, they are telling the truth! Now that’s the kind of consistent and confident lip color I will wear as a mom of three (whose daily beauty routine is typically 5-10 minutes!). Jenny is passionate about her boutique, passionate about the products she sells, and passionate about the impact and transformation it can have on women from all walks of life. She wanted a website to stand out in the industry and make a visual impact on her customers, up-leveling her business and (in my humble–and biased–opinion) sending her soaring in her niche, both as a boutique owner and SeneGence distributor. For her personal brand & website, she wanted a design that is simple and sophisticated, clean and fresh. A friend of hers designed her pretty logo, and we plugged in the branding to the website and created a lovely space for Jenny to share the company she represents. Her new website links to the main company page for product browsing and purchase, and Jenny will be blogging about the products and experience as her business grows (she already has a fun transformation-style post on her blog). 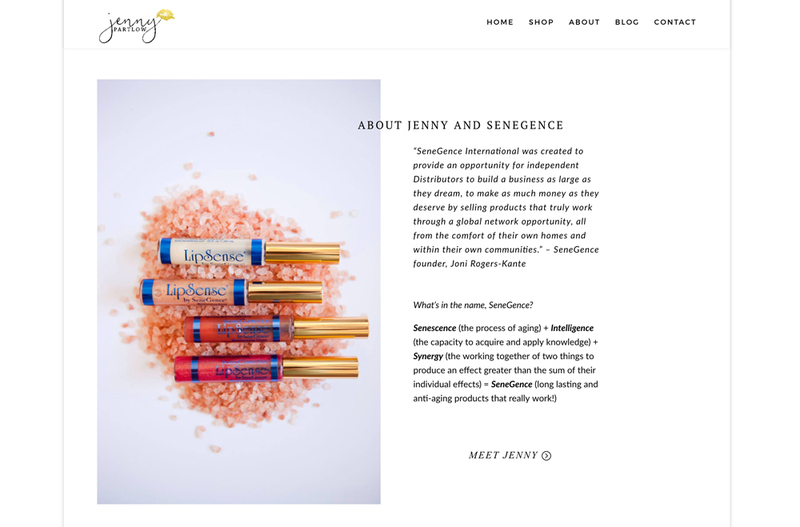 If you want to jump on the nationwide craze that is LipSense (or other SeneGence products), Jenny is definitely your gal. 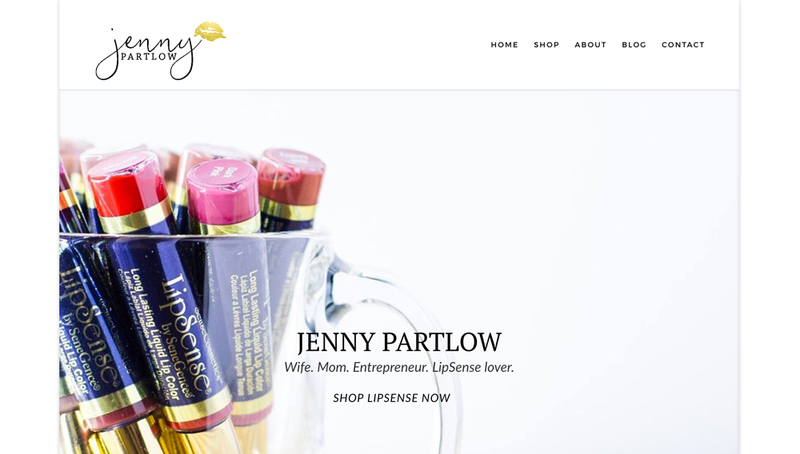 Check out her new website JennyPartlow.com and then visit her fun social media accounts from there! If you are looking for a web design & development of your own, I’d love for you to reach out and connect!